A simple and novel technique for recording afferent discharge due to mechanical stimulation of lanceolate terminals of palisade endings innervating mouse ear skin hair follicles is presented. Bewick, G. S., Cahusac, P. M., Banks, R. W. Combined Recording of Mechanically Stimulated Afferent Output and Nerve Terminal Labelling in Mouse Hair Follicle Lanceolate Endings. J. Vis. Exp. (111), e53854, doi:10.3791/53854 (2016). A novel dissection and recording technique is described for monitoring afferent firing evoked by mechanical displacement of hairs in the mouse pinna. The technique is very cost-effective and easily undertaken with materials commonly found in most electrophysiology laboratories, or easily purchased. The dissection is simple and fast, with the mechanical displacement provided by a generic electroceramic wafer controlled by proprietary software. The same software also records and analyses the electroneurogram output. The recording of the evoked nerve activity is through a commercial differential amplifier connected to fire-polished standard glass microelectrodes. Helpful tips are given for improving the quality of the preparation, the stimulation and the recording conditions to optimize recording quality. The system is suitable for assaying the electrophysiological and optical properties of lanceolate terminals of palisade endings of hair follicles, as well as the outcomes from their pharmacological and/or genetic manipulation. An example of combining electrical recording with mechanical stimulation and labeling with a styryl pyridinium vital dye is given. The lanceolate terminals of sensory axons innervating hair follicles in mammals form palisades around the hair-shaft epithelium. Their purpose is to detect mechanical displacement of the hairs they surround. They are a mix of rapidly and slowly adapting endings that predominantly produce short bursts of activity in response to hair movement. Activity ceases very quickly when movement stops, even in the presence of continued displacement. Here we describe the development of this murine pinna model for correlative studies of structure and function in lanceolate terminals. The pinna has many advantageous features for studying these endings. First, the pinna is essentially two layers of skin apposed back-to-back, with little other tissue between to interfere with access to the follicles and terminals. The skin is very thin and easily dissected due to minimal amounts of tough connective tissue. The innervation is easily accessible and identifiable. While hair follicles are present, they are relatively sparsely distributed, facilitating the stimulation of individual or small groups of follicles mechanically. The thin underlying dermal layer gives good accessibility to the nerve terminals with pharmacological drugs and dyes. This makes them particularly ideal for imaging studies using fluorescence microscopy. The imaging can either be in living terminals, or after fixation and further histological processing. The responses of mechanosensory neurons innervating hair follicles have traditionally been studied in rodent vibrissae1,2 and, to a lesser extent, in isolated skin preparations3,4. These have taught us much about the general principles of mechanosensory physiology in the nerve terminals surrounding the hair shaft. The vibrissal preparation allows exquisite control over the movement of a single hair follicle. However, it can be difficult to decipher the output due to its complexity, as vibrissal follicles contain at least 8 different types of anatomically distinct mechanosensory ending5 and the matching of these morphological types to specific electrophysiological responses is still a matter of dispute. The mouse skin/saphenous nerve preparation is most often used in its depilated state to investigate touch and pain responses. The innervation of hair follicles in such a preparation is less complex but the density of the hair follicles, plus the presence of three different follicle types (guard, Awl/auchene and zigzag hairs) in such close proximity6, means studying the specific responses of a single follicle or single type of ending is again challenging. Moreover, this preparation involves a complex dissection. Finally, in both vibrissal and other skin preparations, it is difficult to visualize the endings involved while the ex vivo preparations are still alive. Thus, tissue sectioning is required even in GFP-expressing mouse lines. Alternatively, it requires further histological/immunological processing such as fixation and/or antibody incubation for immunofluorescence. We have therefore developed the pinna preparation and used it to make electrical recordings from a restricted population of hair follicle afferents and show that membrane cycling occurs in these lanceolate endings, evidenced by uptake of styryl pyridinium dyes. Finally, we showed that the dye does not interfere with mechanical sensitivity, indicating it does not block the mechanotransduction channels. The outcomes of simple stimulation and analysis protocols are illustrated. Mouse post mortem tissue harvest must use approved ethical methods. In the UK, cervical dislocation is a government approved method for adult mice (a listed Schedule 1 method in the UK Animals (Scientific Procedures) Act, 1986 and European Directive 2010/63/EU). This legislation is enforced locally at the University of Aberdeen by the Animal Welfare and Ethical Review Board who reviewed and approved all procedures used in the following protocol. Before dissection, prepare a standard physiological saline, such as Liley's (1956) and saturate it with 90% O2/5% CO2. Liley's saline (mM) is comprised of: NaHCO3 (12), KCl (4), KH2PO4 (1), NaCl (138.8), MgCl2 (1), CaCl2 (2) and glucose (11). Humanely euthanize an adult mouse without damaging the skull near the ears. Here we use C57/Bl6J and MF1 mice but any standard laboratory mouse strain can be used. Ideally, use mice that are <25 g if electrical recording is to be combined with styryl dye labeling, as labeling in larger mice is less reliable, often being found only in restricted circumscribed areas. Remove the head with large scissors or bone shears. Place the head dorsal side up in gassed Liley's in a wide-bottomed dissection dish (50 cm is usually convenient) on the stage of a stereo dissection microscope. Regularly (~10 min) sluice or submerge the head with gassed saline. Carefully incise and separate the skin at the base of the external ear (pinna) with springbow scissors and #3 forceps, exposing the cartilage of the external auditory meatus (EAM). Identify the branches of the trigeminal (mandibular division, MDV) and great auricular nerves as they emerge from the skull in the cleft of the mandibular joint and project through the cartilage base to innervate the concave (anterior) and convex (posterior) aspects of pinna skin, respectively. Near the skull, identify where the two nerve branches exit in the groove between the jaw and the mastoid process. Maximize their length by gently pulling the pinna away from the skull and cut the nerves as close to the skull as possible. Remove the pinna from the head with springbow scissors, taking care to avoid the distal stumps of the divided nerves and minimizing the amount of dense pelage at base of the ear that is removed. Transfer the pinna to a flexible silicone rubber (PDMS)-lined dish filled with gassed Liley's fluid. Open the EAM by dividing it at its narrowest (anterior-most) point. Flatten the pinna, anterior skin (concave) side down and pin to the PDMS carefully at the edges with ~6-8 regularly spaced very fine (~0.2 mm diameter) insect pins. Remove the skin of the posterior aspect of the pinna completely and partially remove the pinna cartilage by blunt dissection with #3 forceps, ensuring the anterior skin is left intact. With the point of a fine insect pin grasped with #3 forceps, gently extend the branches (usually 2) of the MDV that emerge posteriorly between the skin and EAM cartilages. Pin these to the PDMS with the finest possible insect pins, impaling the connective tissue adjoining their cut ends and not the nerve trunks themselves. Remove most of the surrounding connective tissue around them, carefully avoiding damage from excess pulling or cutting. Pin the pinna skin to the PDMS-lined base of a recording chamber with fine insect pins around the edges (~6-8 per ear), placing the cleaned nerves at the base of the ear near two suction electrodes – one for recording (to take the nerve) and the other an indifferent electrode (to provide the neutral signal to a differential amplifier, see7). For the recording electrode, carefully match the aperture and internal diameter of the opening to the combined thickness of the two nerves, so they fit as snugly as possible and for as great a length as possible. Draw the nerves into the electrode by gentle suction from a 2 ml syringe attached to the other end with silicone rubber tubing. Ensure the nerves are straight, not folded or doubled up. Develop a high electrical resistance/impedance fit by using stronger suction to draw connective tissue or an adipose tissue to form a plug that tightly seals the aperture around the nerve. Fill the other (indifferent) electrode with saline by suction if necessary (it may fill by capillary action). Place identical recording wires (silver or platinum) into the internal bore of the recording electrodes to contact the saline and the nerve (recording) or narrowed, fire-polished end (indifferent) of the electrode. Each electrode is soldered individually to different cores of two-core screened cable. Place the bath (ground) electrode (Ag/AgCl pellet) into the bath, and ground it to the screen of the two core cable connected to the recording electrodes. Feed the electrical activity from the two electrodes into the separate channels of a differential amplifier, filter (band-passed 0.2-2 kHz), and view on an oscilloscope screen. Check that channel A (recording) and channel B (indifferent) electrical noise levels look similar. At this stage it may not be possible to see the normal spontaneous action potentials in channel A before the two electrodes are balanced. Redress any differences in background noise between electrodes by increasing the impedance of the recording (channel A) or indifferent (channel B) electrodes. Do this by sucking areolar (adipose) connective tissue further into either electrode, and/or applying greater suction force on the 50 ml syringe. Once 'balanced' in this way, switch back to differential (A-B) recording and look for spontaneous action potentials (APs) in the trace or when stroking hairs at the margin of the pinna. If no activity (spiking) is seen, re-check the tight fit of the nerve in the recording electrode and the areolar connective tissue in the indifferent electrode – usually the tighter (higher resistance) the seal and the more equal the impedance in the two electrodes, the better. With practice, this will achieve a good quality (>2:1) signal:noise ratio. Record the electroneurogram via a lab interface and electrophysiology software running on a computer. An audio output of spiking is very useful and can be achieved by feeding the neurogram through an audio amplifier and associated audio speaker. Adjust the threshold to be just above the baseline noise (identified by the absence of white-noise 'hiss'). To increase drug or fluorescent styryl dye access to the lanceolate endings, carefully peel away the sub-dermal adipose layer near the pinna margin, opening a window of ~5 mm x 5 mm exposing the dermis and base of the follicles (Figure 1A, B). Pin back a fold of ~1 mm of adipose-cleared ear skin at the leading margin (at level of the window just produced, if applicable), leaving a clear saline-filled gap between the apposed skin layers. Gently stroke the hairs protruding along the folded edge with a pin or grounded fine forceps, without touching the skin, to locate the area of maximal AP output on the oscilloscope and the distinctive 'clicks' and 'pops' in the audio output. Position the mechanical stimulation probe – a fire-polished 10 cm borosilicate microelectrode glass attached to a ceramic piezo-electric actuator – so movement is parallel with the skin fold. Place the tip about 0.5-1 mm from skin fold, so it touches the hairs but not the skin. Verify effective stimulation by slowly moving the probe tip manually to deflect the hairs and observe/listen to the spiking. Use the software to drive mechanical stimulation of 1-3 hairs (e.g. 3 sec at 5 Hz sinusoids, every 10 sec. Probe displacement 200-500 µm), and record the stimulation-evoked responses in the nerves. Give several identical mechanical stimulation trains at 10 sec intervals. Optimize the probe position for repeatability, then reduce frequency of stimulation according to experimental protocol (e.g. drop repeat rate from 10 sec to 30 sec). Use the software to discriminate AP-like activity e.g. using a simple threshold set to ~2x the high-frequency noise amplitude and ~25% of the largest APs. Count the APs crossing the threshold as 'events', quantifying the frequency and characteristics of the APs produced. To examine the effects of styryl dyes on stimulus-evoked afferent firing and terminal labeling, add the appropriate concentration of a styryl dye of choice, to the bathing solution and continue with the electrical recording. After the required exposure time (usually at least 30 min), prepare the preparation for viewing the follicles. Unfold the skin flap by removing the retaining pins, and expose the cleared dermal area to reveal the terminal labeling. Wash away external dye with dye-free saline, making 3 complete changes of saline. Incubate in the final change of gassed dye-free saline for 10-15 min to allow the most persistent dye contamination to leach from exposed/external membranes. Remove non-internalized dye remaining on membranes with a sequestering agent (sulfobutylated beta-cyclodextrin, 1 mM, 5 min) in saline. Transfer the recording chamber to the stage of an upright epifluorescence microscope and engage the chamber with the stage/slide movement mechanism. Illuminate the preparation with excitation light appropriate for the styryl dye. Use a 10X or 25X fluorescence microscope objective to observe the follicle labeling (Figure 1). The electrophysiological recording arrangement, with the sub-cutaneous adipose tissue removed to expose the hair follicles, is shown in Figure 1A. A portion of this exposed area is shown at a higher magnification in brightfield illumination in Figure 1B. Folding the pinna margin up and back on itself in this area exposes the epidermal surface. This positions the hairs on the edge of the fold to protrude horizontally, in an ideal situation for mechanical stimulation with a blunt probe (not shown). Figure 1C shows that after dye exposure and returning the margin to the unfolded position again, the stimulated follicles at this position have been labelled with a styryl pyridinium dye. Electroneurograms from preparations typically show ongoing AP activity even in the absence of imposed movement of the glass-fiber probe, including APs of the largest size (Figure 2Ai-iii). Activity occurs at a rate of about 10-20 impulses/sec ('spikes' trace), showing no structure or signs of tonicity, as the auto-correlation for the intervals between periods of stimulation are quite flat. During 5 Hz, 100 µm mechanical stimulation of the hair shafts, overall output typically rises to 20-50 impulses/sec, or 4-10 per sinusoidal cycle. Construction of cycle histograms then reveals strong entrainment (so-called 'phase-locking') of the responses (Figure 2Bi-iii)). This is quite repeatable, although the phase of the waveform at which the responses are locked depends upon their position, i.e. at which point in the movement the vibrating probe it contacts the hair. A simple threshold detection (horizontal line crossing the neurogram traces in A(i-iii)) has been used for this analysis. However, recording software functionality can often be used in a more sophisticated manner to discriminate features of spike size and shape. This can then isolate responses of particular afferent fibers by these characteristics to allow pseudo-single-unit recording analysis to be undertaken. Figure 1: Electrophysiological Recording Arrangement and N-(3-triethylammoniumpropyl)-4-(4-(dibutylamino) styryl) Pyridinium Dibromide Labeling of Hair Follicle Afferent Lanceolate endings. (A) A pinna preparation set up for an electrophysiological experiment showing the pinna orientation, the location of the nerves, the recording electrodes and the exposed area of follicle innervation after adipose tissue removal. (B) Several hair follicles are visible in bright field illumination in the area cleared of overlying adipose tissues down to the dermis. The dark, usually bilobed, shapes are sebaceous glands. (C) Enlarged view of the boxed area in B) showing two lanceolate endings labelled with the styryl dye N-(3-triethylammoniumpropyl)-4-(4-(dibutylamino) styryl) pyridinium dibromide and imaged after mechanical stimulation by epifluorescence microscopy. From7, with permission. Please click here to view a larger version of this figure. Figure 2: (A) Stimulus-evoked Activity Recorded from the Mouse Pinna. (Ai-iii) Examples, taken from 3 different experiments, of activity from continuous neurograms from pinnae in standard Liley's saline solution. Each record shows a 5 sec section approximately 5 min after the start of recording, including a 3 sec period of sinusoidal displacement of a small number of hair shafts. The mechanical stimulation was repeated every 30 sec throughout the continuous recording, which usually lasted for 1-2 hr. Custom script files marked individual events that crossed a threshold set by the horizontal cursor (spikes), as well as the onset of each sinusoidal cycle (period). (Aiv) The command signal for sinusoidal displacement. (B) Analysis of Stimulus-evoked Spiking Activity. (Bi-iii) Cycle histograms in 3° bins constructed from the neurogram samples (Ai-iii) respectively, showing the responses of presumed lanceolate endings to mechanical stimulation by 5 Hz sinusoidal displacement of hair shafts by a glass probe. Note the marked phase-locking, at different phases of the cycle, depending upon their position relative to the starting position of the mechanical probe. (Biv) Normalized probe displacement sinusoid; the actual amplitude was approximately 100 µm. Please click here to view a larger version of this figure. Here, we have developed a relatively simple preparation that can be rapidly dissected, has low hair follicle density and allows for relatively selective mechanical stimulation of a small number of hair follicles. It is readily accessible for electrophysiological recording and live-cell fluorescent imaging, including the responses to dye application to visualize the mechanically stimulated hair follicles, i.e. imaging follicles with defined electrophysiological responses. While we have not done so, this system also seems readily amenable to sub-dividing the sensory nerve for single unit (single sensory axon) recording and using targeted GFP-expression for visualizing sensory terminal ending morphology. We have used the ear skin preparation to investigate the characteristics of the internalization and release of the fluorescent membrane styryl pridinium dyes7, a technique originally developed to study localized vesicle membrane recycling in synaptic terminals8. In synapses, imaging is also readily combined with simultaneous electrophysiological recording of responses in identified terminals8,9. It was in these early studies that we first noted the dyes were also internalized by mechanosensory endings10. For sensory neurons in culture and in cochlea hair cells, much of the labeling by styryl pyridinium dyes seems to involve dyes passing through the mechanosensory channels, which they then block11,12. The dyes then label intracellular membranes, and this labeling is irreversible. However, in hair cells that are not mechanically stimulated13,14 and in fully differentiated primary sensory nerve terminals in situ, such as Ia endings in muscle spindles15, and in the lanceolate endings here7, styryl dye labeling seems to reflect membrane endocytosis, since labeling is reversible and does not block the mechanosensory responses7,15,16. While some dye internalization by channel permeation in these endings cannot be ruled out completely, it is clear from the continued firing during dye incubation and the reversibility of the labeling that the great majority of the labeling in differentiated terminals in situ is by internalization with recycling vesicle membrane. Thus, this simple technique is readily used for combined electrical and optical monitoring of a range of mechanosensory terminal functions in ex vivo tissues. As with most practical techniques, reproducibility will require repetition and practice. Some of the key points worth particular attention will now be described. Throughout the dissection and recording session, maximize tissue viability and survival by ensuring the preparation is constantly perfused with saline fully saturated with 95% O2/5% CO2. Ensure the hair follicles are not displaced during this process, which will stimulate sensory ending firing. Either use a continuous, laminar flow perfusion system, or carefully bubble gas through the organ bath with fine tubing at a distance from the preparation, or carefully refresh solutions every 20-30 min, keeping the preparation below the saline surface at all times. Suction recording electrodes are made by modifying sharp electrode borosilicate pipettes normally used for intracellular recording. First, carefully break off the sharp tips with #3 forceps to give the appropriate internal diameter to fit the nerves and fire-polish by very brief (<1 sec) exposure to Bunsen burner flame (see 2.4 and 2.5). To get a good signal-to-noise ratio when recording, it is essential that the electrical impedance (resistance) in these two electrodes is both maximized and equal. Do this by paying attention to the following in the two electrodes. For the recording electrode, ensure the internal diameter is a snug fit for the nerve, and the maximum length of nerve is drawn into the recording electrode. Try to use the connective tissue surrounding the nerve to effectively seal the electrode tip. Alternatively, or in addition, draw the narrow end of a suitably sized, tapered piece of adipose tissue in alongside the nerve. Then, plug the electrode tip by applying strong suction for ~1 min with a 50 ml syringe attached to the tubing. For a well-sealed tip, applying strong suction will simply strengthen the effectiveness of the plug and will not draw in more liquid or nerve. To avoid nerve damage, however, ensure that the connective tissue is cushioning the nerve from compression on the surrounding material and EAM cartilage. The indifferent electrode should mimic the resistance/impedance of the recording electrode as closely as possible. This is helped by carefully fire-polishing the tip to as small an aperture as possible without actually sealing it. If further resistance is needed, then plug the end of the indifferent electrode with adipose connective tissue, as described above for the recording electrode. The electroceramic gives exquisite control over mechanical displacement, both spatially and temporally. However, take care making electrical connections – high temperatures destroy them, so do not use hot solder. Use metal-loaded epoxy glue, or use a specialist push-fit socket recommended by the supplier. This will both hold it firmly and establish electrical connectivity. Attach the glass stimulating probe to the electroceramic with standard epoxy resin. Fire-polish the end of a standard 10 cm x 1.5 mm diameter borosilicate glass capillary tubing used for making patch or sharp electrodes for electrophysiological recording to minimize the risk of tissue damage. If single hair follicle stimulation is required, fire-polish the tip to fit a single hair, and position the probe with a single hair inside the open aperture. This gives exquisite control over a single hair. For styryl dye labeling, it is generally more uniform in tissues from younger animals. It is not entirely clear why, but this likely reflects less mechanical trauma and more effective deep tissue removal from the younger tissues. Be thorough in removing the foamy layer resembling expanded polystyrene overlying the hair follicle bases. However, avoid being too vigorous, as this risks removing the nerve plexus layer and associated lanceolate terminals. If there is little or no electrical response to hair follicle movement, and styryl dye application leads to predominant labeling of sebaceous glands (yellow/white), with distinct autofluorescence of the base of the hair shaft rather than lanceolate endings (orange/yellow), over-enthusiastic clearance has damaged the underlying tissues. Finally, using a dye-chelating agent before imaging greatly improves image contrast and quality of the final images. This technique could be useful in a range of further studies. These could include, for example, screening for the mechanosensory channel(s) responsible for stretch-evoked responses, by incubating the preparation with pharmacological ligands selective for candidate channels or screening mouse lines with such channels genetically deleted. The latter could be combined with fluorescence assessment of any changes in terminal morphology due to genetic manipulation in mouse lines, e.g. with Npy2r-linked GFP expression17. A final example may be investigating the role of synaptic-like vesicles (SLVs)7 in these lanceolate terminals by examining the effect of modulators of SLV turnover (Ca, Mg, latrotoxin, glutamate receptor ligands) on stretch-evoked responses and styryl dye uptake/release. Thus, this new technique opens up a range of potentially interesting avenues of research in mechansensory neuroscience. The work was in part funded by UK Medical Research Council project grant G0601253 to G.S.B. and R.W.B. PDMS - Sylgard 184 Dow Corning Flexible, inert, translucent solid silicone polymer. Austerlitz Insect pins Fine Science Tools 26002-10 Very fine pins to attach pinna preparation securely to the PDMS with minimal damage. AC Differential Preamplifier Digitimer Neurolog NL104A Amplifying the size of the incoming afferent electroneurogram. Differential recording minimises the extraneous electrical noise and baseline drift. High/Low-pass Filter Digitimer Neurolog NL125 Signal conditioning, by reducing extraneous electrical noise to ensure best signal to noise ratio. Spike Trigger Digitimer Neurolog NL201 Sets the event detector threshold and displays it on the oscilloscope. This shows the action potential detection efficacy. Oscilloscope Digitimer PM3380A We use this old model but any standard oscilloscope will suffice. Piezo electroceramic powersupply Home made 0-200 V DC output to drive the ceramic wafer displacement, with variable electronic control of output via recording/stimulation software and computer interface. We use Spike2 software and 1401micro computer interface. Laboratory interface Cambridge Electronic Design (CED) 1401 micro Electrophysiology interface, between the amplifier/filters and the computer. It inputs the electroneurogram and also drives the electroceramic movement. FM1-43/Synaptogreen C4 Biotium/Cambridge Bioscience BT70020 Fluorescent membrane probe that reversibly partitions into the outer leaflet of cell membranes. Used predominantly for monitoring vesicle membrane endo-/exocytosis. Advasep 7 Biotium/Cambridge Bioscience BT70029 A sulfonated b-cyclodextrin derivative that chelates FM1-43 (& other styryl pyridinium dyes) out of the exposed membranes, leaving internalised dye to be seen more clearly by lowering the background labelling/fluorescence. Volocity 3D Image Analysis Software Perkin Elmer Volocity 6.3 Image capture and analysis software. Cahusac, P. M. Effects of transient receptor potential (TRP) channel agonists and antagonists on slowly adapting type II mechanoreceptors in the rat sinus hair follicle. J. Peripher. Nerv. Syst. 14, (4), 300-309 (2009). Fagan, B. M., Cahusac, P. M. Evidence for glutamate receptor mediated transmission at mechanoreceptors in the skin. Neuroreport. 12, 341-347 (2001). Price, M. P., et al. The mammalian sodium channel BNC1 is required for normal touch sensation. Nature. 407, (6807), 1007-1011 (2000). Ranade, S. S., et al. Piezo2 is the major transducer of mechanical forces for touch sensation in mice. Nature. 516, (7529), 121-125 (2014). Ebara, S., Kumamoto, K., Matsuura, T., Mazurkiewicz, J. E., Rice, F. L. Similarities and differences in the innervation of mystacial vibrissal follicle-sinus complexes in the rat and cat: a confocal microscopic study. J. Comp. Neurol. 449, (2), 103-119 (2002). Li, L., Ginty, D. D. The structure and organization of lanceolate mechanosensory complexes at mouse hair follicles. eLife. 3, 01901 (2014). Banks, R. W., et al. Glutamatergic modulation of synaptic-like vesicle recycling in mechanosensory lanceolate nerve terminals of mammalian hair follicles. J. Physiol. 591, (10), 2523-2540 (2013). Betz, W. J., Bewick, G. S. Optical analysis of synaptic vesicle recycling at the frog neuromuscular junction. Science. 255, (5041), 200-203 (1992). Reid, B., Slater, C. R., Bewick, G. S. Synaptic vesicle dynamics in rat fast and slow motor nerve terminals. J. Neurosci. 19, 2511-2521 (1999). Betz, W. J., Mao, F., Bewick, G. S. Activity-dependent fluorescent staining and destaining of living vertebrate motor nerve terminals. J. Neurosci. 12, 363-375 (1992). Drew, L. J., Wood, J. N. FM1-43 is a permeant blocker of mechanosensitive ion channels in sensory neurons and inhibits behavioural responses to mechanical stimuli. Molecular Pain. 3, (1), 1 (2007). Griesinger, C. B., Richards, C. D., Ashmore, J. F. FM1-43 reveals membrane recycling in adult inner hair cells of the mammalian cochlea. J. Neurosci. 22, 3939-3952 (2002). 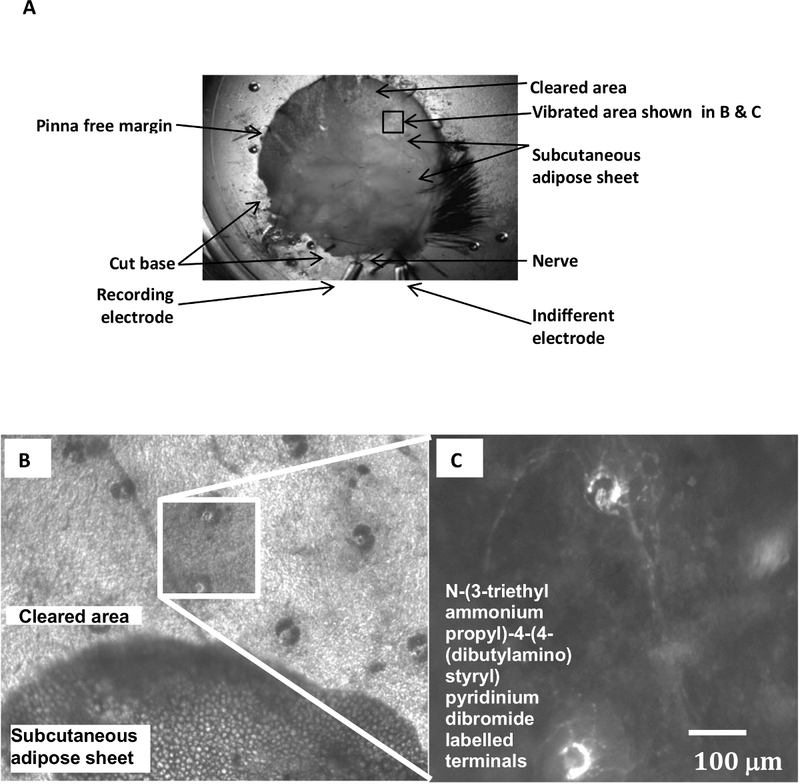 Griesinger, C. B., Richards, C. D., Ashmore, J. F. Apical endocytosis in outer hair cells of the mammalian cochlea. Eur. J. Neurosci. 20, (1), 41-50 (2004). 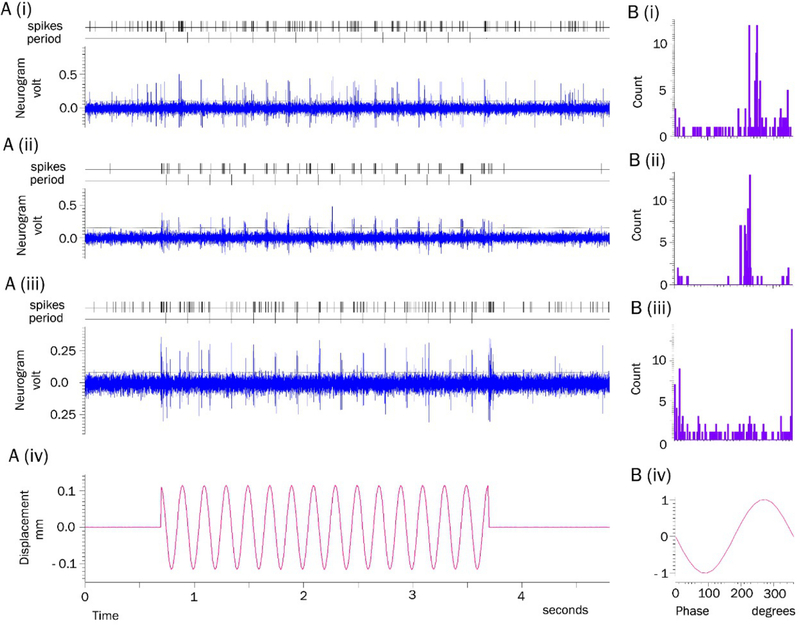 Bewick, G. S., Reid, B., Richardson, C., Banks, R. W. Autogenic modulation of mechanoreceptor excitability by glutamate release from synaptic-like vesicles: evidence from the rat muscle spindle primary sensory ending. J. Physiol. 562, (2), 381-394 (2005). Watson, S., Aryiku, C., Banks, R. W., Bewick, G. S. Comparison of gadolinium and FM1-43 as blockers of stretch-evoked firing of rat muscle spindle afferents. Proc. Phys. Soc. 21, (PC22), (2010). Li, L., et al. The functional organization of cutaneous low-threshold mechanosensory neurons. Cell. 147, (7), 1615-1627 (2011).